Snack Girl features peanut butter A LOT. I happen to love the stuff and I use it almost every day. It is super nutritious. The best peanut butter is just roasted and ground peanuts without any extra sugar or oil. The processing of peanuts is minimal and it makes a spread that goes with so many fruits and vegetables. In my opinion, peanut butter should not be avoided because it IS nutritious. What if you wanted to cut down on your peanut butter consumption? Like me, you might be using a bunch of it to make your apple, banana, or broccoli taste delicious. I got out some spoons and tasted it alongside my regular peanut butter. I am shocked and happy to say that PB2 tastes yummy. I would not have known that the fat was missing. It has a strong peanut flavor and in one swoop I save 145 calories! The nutrients are now missing from the peanut butter. I guess they left with the fat. 0% DV of Iron, etc. I am planning to use some regular peanut butter some of the time, and PB2 some of the time. I might add a dash to my smoothie and try my no bake peanut butter ball recipe with it. 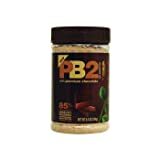 Bell Plantation also puts out a PB2 with chocolate (that I haven't tried) - but it gets good reviews on Amazon. It has 45 calories for two tablespoons. NOTE: After I posted this, readers commented that there is a good deal for PB2 on Netrition.com. 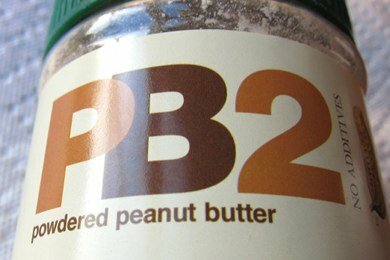 Do you use PB2? What do you use it for? I've reviewed both at my blog at CrazyFoodDude.com and now love both. They are staples of my diet when I need a peanut butter fix. You can also get them for cheaper at netrition.com as well. Both of the PB2 flavors are delicious! They make great mix-ins for oatmeal and I also love to use the plain PB2 as dip. I've found that ordering them from netrition.com is much less expensive than ordering from Amazon. I think I paid under $5 for a small container last time. Great find! I was wondering when you were going to feature this product. I personally like it. Coincidentally,I was having some flourless PB2& banana muffins this morning. 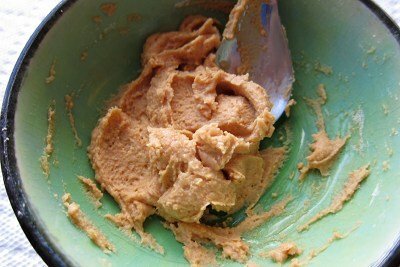 I took 1 cup of the PB2 powder,a half of a teaspoon of baking powder,vanilla extract,a pinch of salt,a bit of sweetner,a little bit of cinnamon and a whole banana and put it into a food processor and added some water and processed it until it had a smooth,creamy consistancy. 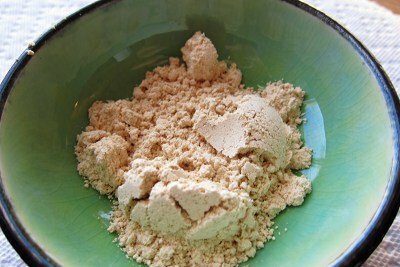 You could even eat this raw like a pudding or pie filling if you want (but leave out the baking powder) but if you want to make "muffins" keep the baking powder and bake on 400 degress for 20-25 minutes and it should make 4 small muffins. They are great fresh out of the pan while still warm or you can reheat them the next day or even freeze them for later use,but they are much better fresh. This sounds like it went through some heavy processing. Fats in moderate amounts are good for you. They help keep you full and absorb other nutrients. The amount you'd use on a PB&J sandwich or in a smoothie is nothing to worry about. I like is straight out of the jar. Dampish things like apples can be dipped into it and banana slices can be shaken in a bag to coat. Very little is needed. Also adding just a couple teaspoons full to pancakes is great. Also great in smoothies. i LOVE trader joe's (now discontinued) peanut flour! luckily i hoarded it when i heard it was being cancelled and now have lots of packages in my cupboard! however, i will be ordering pb2 when i run out ... they even have a banana flavor! what can i say, i'm a sucker for all the taste w/out the calories! I have been using PB2 for about 2 months now and love it! Don't like the chocolate flavor for some reason (even though I love chocolate!). I have lost 4-5 lbs by eating this every day for lunch instead of regular PB without even trying. I LOVE the peanut butter with chocolate- it is SOOOO good!! It is my "new" wonder food and I've told everyone at my weight watcher's meetings about it...netrition is the cheapest, as shipping for any and all is only $4.99...and half the price of amazon...use it daily with my apple snack...love your site...its a good job you do!!! So glad to see that you have included PB2 in your line-up of "good" eatables. @Shannon - you do get some protein - but my thought was that you don't want to stop using REAL peanut butter altogether since this powdered form isn't as nutritious. If you aren't a peanut butter lover - you don't need to shift. That is my advice. I hope this makes sense. Here is a store locator of stores carrying is product. I've been buying it directly from the Bell Plantation website. Buying a case of 12, brings the price to about $5 per jar.